How do I create outcome groups for a course? Grouping outcomes in a course allows for organization of multiple related outcomes. 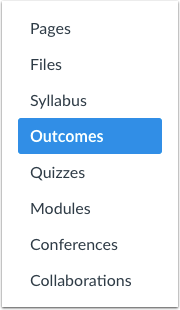 In Course Navigation, click the Outcomes link. 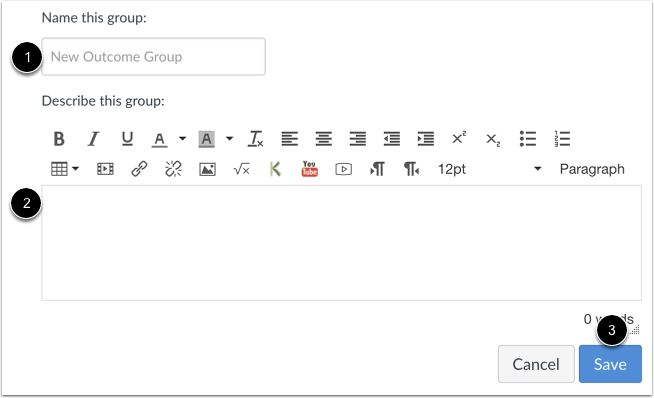 Click the New Group button. Type a Learning Outcome group name in the Name this group field . Type a description in the Rich Content Editor . Click the Save button . View the Outcome group. You can create new outcomes within the group by creating a new outcome. You can also move outcomes and outcome groups into the new group. Previous Topic:How do I create an outcome for a course? Next Topic:How do I import outcomes for a course? Table of Contents > Outcomes > How do I create outcome groups for a course?